The last 12 months would have to have been the quickest I have ever experienced. No doubt, largely due to the fact that we had our first child a little over a year ago. You only have to ask any parent and they will agree that once you start having kids the years speed up. So here we are again, about to celebrate Christmas and reflect on the year that was 2014. This year we have decided to go with a seafood themed menu rather than spend too much time prepping in a steamy kitchen. Australian Summers are too humid for my liking and I really don't fancy being a hot sticky mess as a result of spending too much time in a hot kitchen with the oven blaring and several pots bubbling away. 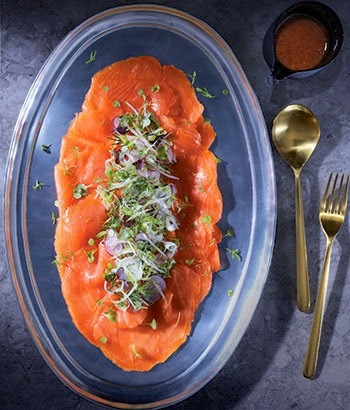 So this year I have come up with some perfect paleo friendly Summer Christmas and NYE menu ideas inspired by premium Tasmanian Superior Gold Smoked Salmon. 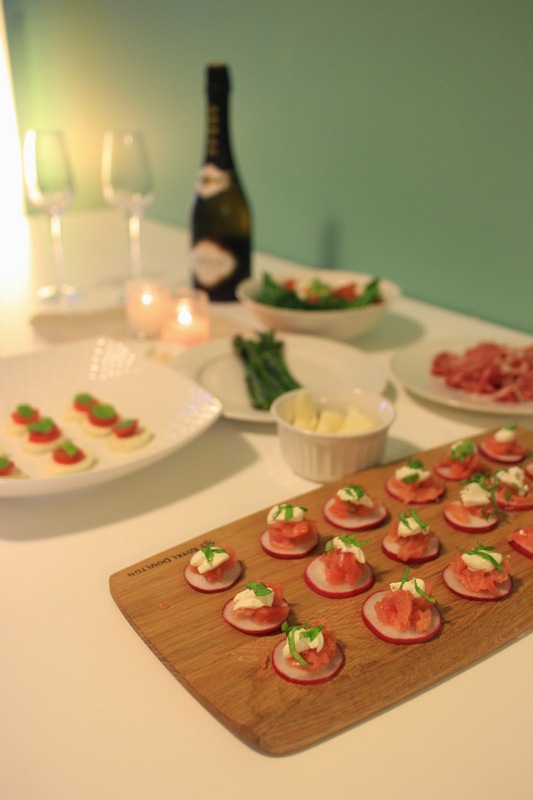 These primal friendly smoked salmon bites provide the perfect starter to any celebration. SO simple to prepare, they taste amazing and look impressive. 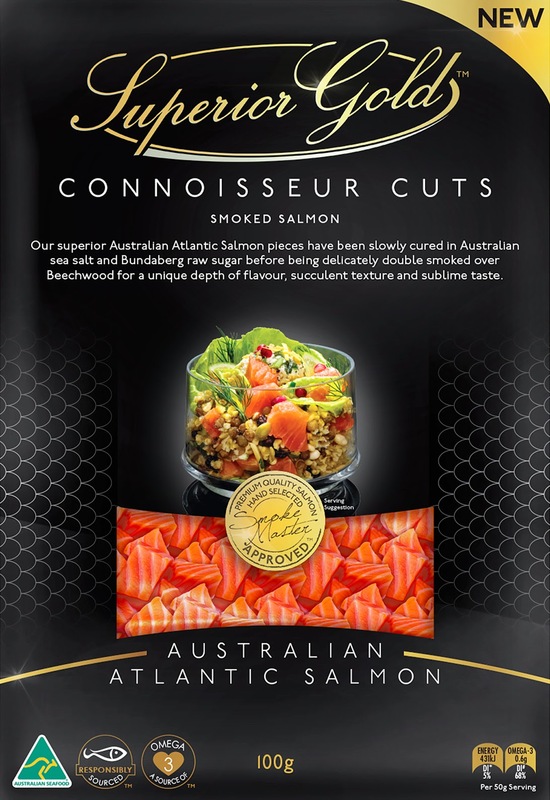 The Connoisseur Cuts as the name suggests is pre-cut into small flaked pieces which make it the perfect choice when time is at a premium. The salmon itself has a lovely flavour after having been slow cured and double smoked over Beechwood. 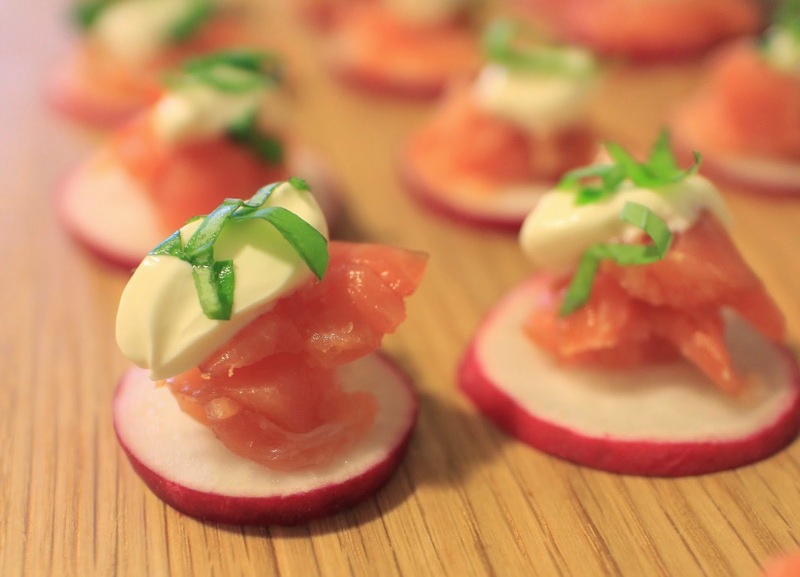 Top each radish disc with salmon, a dollop of the sour cream or greek yogurt and some fresh herbs. This salad is divine and perfect for our warmer months. Best of all it is fresh, super quick, easy to prepare and paleo friendly. 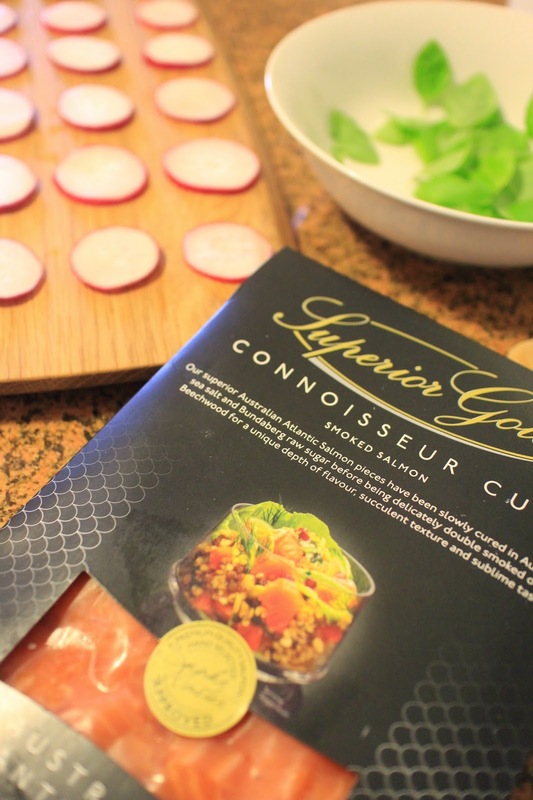 The combination of flavours really works and the sweetness of the apple and mint combines well with the crunch of the fennel and the silky texture of the fresh smoked salmon. Why not continue the Tasmanian theme and enjoy a bottle of bubbles from the same region. I can highly recommend this bottle of Arras. To get you in the mood for celebrating, this year the talented Georgie Kay from Gorgeous shares with us her favourite tips for the perfect celebration. Try to resist the urge to ‘theme’ your occasion, and never underestimate the impact of simplicity. Choose a colour and run with it, for New Years Eve we suggest a touch of gold. You cannot do a party without fresh flowers. Use one flower variety per vase and then cluster your vases by hue. Look at vessels you already have around your home that could be used as a vase. Items like your grandma’s teapot or a water jug can make for a beautiful display. Things don’t have to match. Your party will tell a story if there is an eclectic feel to the styling. Using different chairs or mismatched crockery and cutlery adds layers of texture to your table. You can find beautiful, unique pieces at warehouse sales! 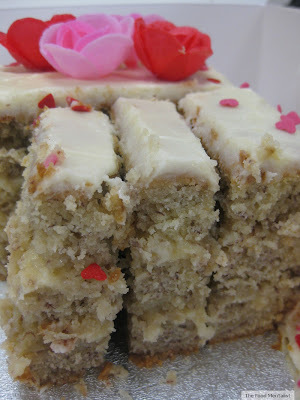 A handmade touch will personalise any occasion. Simple DIY touches, like handwritten place cards, add individuality and warmth to your table. They are also cheap, easy and fun to make. Similarly, a hand painted herringbone or spotty paper tablecloth will add personality to your occasion and could be an activity to share with your family. Surprise and delight your guests. Don’t limit your imagination. Perhaps you could serve food on an unexpected object like a colourful tile, or transform your garden by hanging fabric from tree branches. For a New Years Eve party, an unexpected take home gift of a recovery breakfast recipe. I absolutely love fresh crunchy asparagus when paired with smoked salmon. 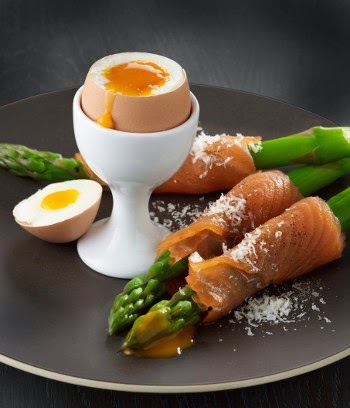 For the perfect seasonal paleo inspired smoked salmon breakfast I can highly recommend this recipe of Boiled Eggs with Smoked Salmon Wrapped Asparagus. How will you celebrate Christmas and NYE this year? 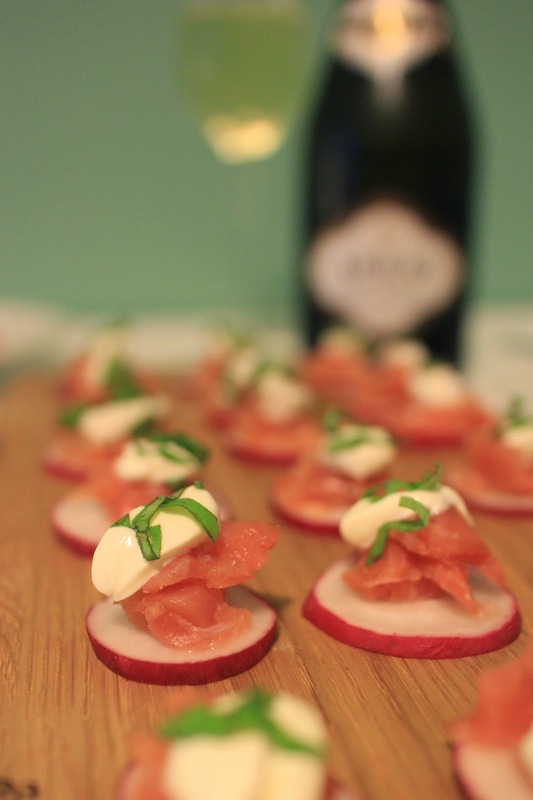 Follow me on Instagram for more smoked salmon recipe ideas.